Click here to learn more about our CureSearch partnership program! Choosing the right mouthguard is essential. 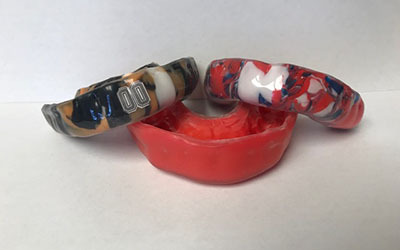 There are three basic types of mouthguards: the pre-made mouthguard, the "boil-and-bite" fitted mouthguard, and a custom-made mouthguard from our practice. When you choose a mouthguard, be sure to pick one that is tear-resistant, comfortable and well fitted for your mouth, easy to keep clean, and does not prevent you from breathing properly. You should replace your mouthguard if you notice it has become worn and no longer fits properly. Do not chew on or cut pieces off of your mouthguard. Mouthguards come in different shapes and sizes; ask us which is best for you. If you have any problems with your custom mouthguard, be sure to bring it with you so our team can provide a properly fitting mouthguard. Sports-related injuries to the mouth and jaw are some of the most common injuries incurred by athletes. Our goal is to help minimize your chances of a sports-related injury to your smile. Be sure to ask us about custom mouthguards at your next appointment — GO TEAM!